Hardware cryptocurrency wallet manufacturers are always looking for ways to improve their product. Ledger is clearly one of the market leaders in this regard. Their hardware wallet supports a few different currencies and additional coins will be supported soon. One of those to-be supported currencies is Decred. According to Twitter, DCR support will come to both the Ledger Blue and Nano S in the near future. A big development for this altcoin, to say the least. It is evident companies such as Ledger have to look beyond Bitcoin these days. With so many people diversifying a portfolio through altcoins, secure wallet solutions are in high demand. For example, most altcoins don’t even have a mobile wallet right now. This forces users to either use a desktop client or keep money in an exchange. Neither of those solutions is appealing by any means. After all, no one wants to run dozens of desktop clients for different altcoins these days. For the Decred community, a new solution is seemingly imminent. They will be one of the few non-top 10 cryptocurrencies to receive hardware wallet support. This is a big step for Decred, to say the least. Their team has made a lot of progress over the months yet hardly gets any recognition for their work these days. Everyone is focusing on what the next pump of the day will be rather than acknowledge innovative currencies. 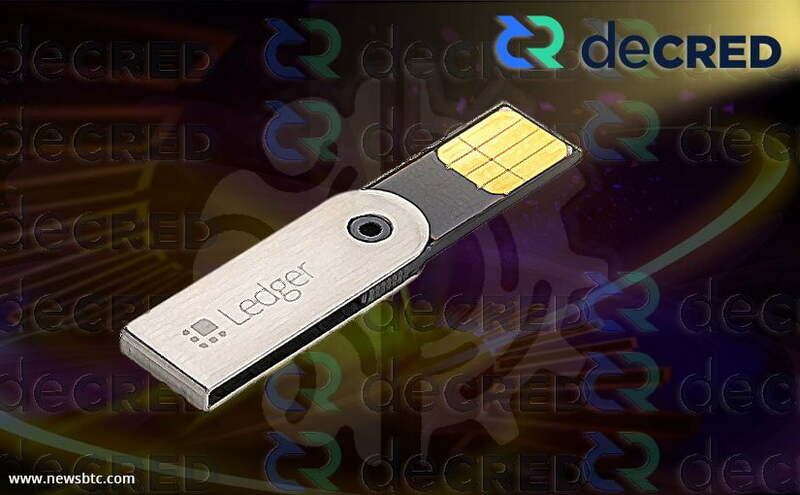 Hardware wallet manufacturer Ledger has certainly paid attention to this particular currency, by the look of things. Otherwise, they wouldn’t integrate it anytime soon. More specifically, this Ledger hardware wallet support is a big milestone for Decred. Right now, the French company is looking to add more functionality to their products. Supporting additional currencies is a logical step in the evolutionary process. Picking the coins worth supporting is not all that straightforward, though. There are over 1,000 different cryptocurrencies and as many digital assets. Moreover, several thousand altcoin projects aren’t even tracked by most major platforms, yet they all have their own small communities. Expanding into the altcoin scene will be a big challenge for Ledger, to say the least. For the time being, it is unclear when this integration will come to fruition. It’s good to see the French company pay attention to Decred, though. The team is also working with the Litecoin developers on future cross-chain atomic swaps. Both of these developments will have a big impact on the Decred ecosystem as a whole. Interesting things are taking place as far as this altcoin is concerned, that much is evident. Whether or not this will influence the DCR price, remains to be seen.